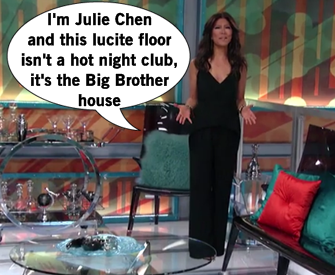 Eight houseguests enter the Big Brother house on night one of the two-night premiere, though not before Julie Chen has a lay of the land and struts through the house. The house has been redecorated with an ocean theme in the living room and it's pretty beautiful. The chess area also has a cool lucite floor for lots of peeping, or upskirts if you're a creep. Thankfully Julie was in an empty house and chose a sultry two piece that gives off jumper vibes. Anywho, Julie gives the schpiel about twists, etc. and let's the eight loose into the house so they can choose beds and start making alliances way too fast. The original eight gather in the living room with their glasses of champagne and introduce themselves. Or rather, introduce the version of themselves they'll play in the game. Da'Vonne says she's a second grade teacher, but she's actually a professional poker dealer. Hot bland guy Clay omits the part where he was a college football player. The ladies swoon for Clay, but he has his eyes on tan, blond, smiley Shelli as they are both Southern, attractive, and have heart murmurs. But the big news Audrey announces to the house she is the first transgender person to live in the Big Brother house. 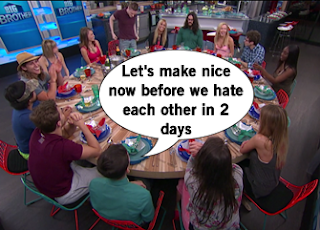 Everyone reacts positively so yay, it's not Big Brother 15 again! But Audrey's no stunt cast: she's here to win, quickly forming a girls alliance with Shelli and Da'Vonne. Julie appears on the TV to announce the first twist of the season which she teases as a "fan favorite." Proving yet again that producers have no idea what fans of this show like, the returning twist is the Battle of the Block competition. Two HOHs, four nominees, and the potential for the HOH to be evicted in the same week of power. Guess they forgot this sank pretty quickly last season due to its redundant nominees, use of pawns, and thrown competitions. Anyways, seven houseguests compete to become the first HOH in a competition called "Flying Tomatoes." Yes, seven as one person has to give up the chance to play so Da'Vonne volunteers with the caveat of "Don't nominate me. "The houseguests balance on little planks while catching and collecting red balls painted to resemble tomatoes, while also being shot at with red paint and being boo'ed by sound effects. James the Asian Hillbilly performs way above expectations, taking a lead with tomatoes caught and drawing all eyes on him. 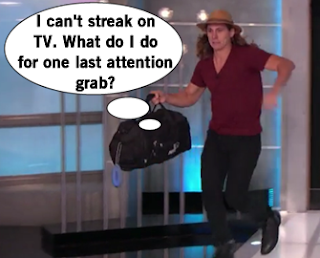 He's the front-runner to win until all four remaining houseguests slip off the planks at the same time. To determine the winner, they actually have to go to an instant replay to see who hit the ground last, and James still wins. Expect the unexpected! Julie corrals the houseguests into the living room again for twist #2, a totally new twist to the game. 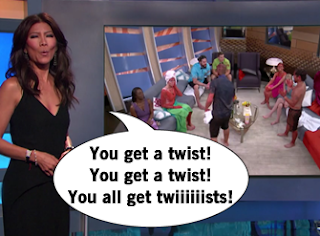 The twist is there is a new twist each week and it's called the "BB Takeover." A horrendous musical cue will play before a new takeover twist is in play. So it's not one twist: it's an onslaught on [terrible] twists. And as if we're LACKING twists, Julie announces to just the viewers that the twin twist is in play this year. One houseguest has an identical twin and they'll be swapping in and out for weeks. If they survive five weeks, both get to play the game as individuals. It was fun in BB5, so I'm open to it. Unless the twin is a clunker of a BB player. Six more houseguests enter the house on the second night of the premiere, but first Julie Chen gives them the lowdown of all the lame twists in play this season. 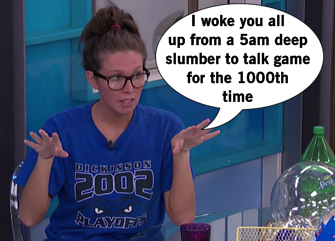 While there's lots of greetings and hugs, Vanessa is quick to get into the game and get the lowdown of who is the first HOH and what's happened so far. No one believes loud John is a dentist, Vanessa lies about being a poker player, and Jason charms with being a gay supermarket bagger that lives in his mom's basement. Audrey gets another round of applause for her transgender announcement. After introductions, the group points out that there are two empty seats at the table. That's right, two more houseguests are going to enter the house. The first BB Takeover happens with special guest Phil Keoghan of The Amazing Race. He joins The Chenbot outside of the house to give us a "gift" of Amazing Race players to play Big Brother, since BB alums have run the race before. Joining the cast of BB17 are Jeff and Jackie, a blind date couple from last season of The Amazing Race that you probably didn't watch. They're only close friends, not dating, so basically it means they can hookup with whoever they want in the house. The horrendous BB Takeover music plays and Phil talks to the houseguest to introduce the pair entering. Vanessa takes the bullet to sit out of HOH competition #2, which has the seven competiting houseguests holding onto a stake which just looks like a leafless tree. The twist to the competition is that they have bungee cords which are yanking them into the sky potentially, maybe to be probed by alien beings. Wedgies, sore muscles - all in the battle for that sweet HOH room. But if you're concerned this challenge lacks the gross factor, alien poop falls down from the sky and once you're ripped off the pole, the alien slimes you even more. Jason and Jackie are the final two, so he makes a deal with her to not nominated her. Jason becomes the second HOH this first week. With two guy HOHs, the girls fear the worst. But could this be a season of change? James and Jason show off their new HOH room, which is a beautiful blue and silver room with the same lucite floor but instead it has cloud posters beneath. A kingdom in the clouds over the normies downstairs! Once they get alone time, James and Jason get on the same page strategy-wise, recapping the day and what the other houseguests are like. Guess who they don't like? Jace. He's friendly with everyone, a competition threat, and talks on a seashell phone in a hot tub with his new "bro" Austin. Will and Boogie, you are not. Another pair in the house are former Amazing Racers Jeff and Jackie, which we learn Jeff declined dating post-show. Since they've already had a cool reality TV experience that makes them a target, they plan to avoid each other to be less obvious that they are the most obvious partners ever. 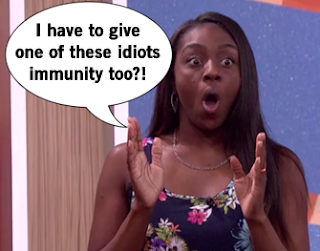 The horrible BB Takeover music plays and Phil Keoghan shows up again to give good news to Da'Vonne and Vanessa after an earlier teaser. They each receive the "BB Fastforward" which means they can't be nominated or evicted this week AND each get to grant immunity to another houseguest. After a few rounds of campaigning/begging, Da'Vonne picks Liz for immunity and Vanessa picks Austin. But Da'Vonne's choice burns her allies Audrey and Shelli, who don't think it would've made a target at all. But Shelli is on the fence anyways because she's a little more into Clay time than the girl alliance. So Da'Vonne and Audrey make an alliance with James and Jason, at least for this week. Everyone's on the same page with the big picture plan: backdoor Jace. To backdoor someone you needs pawns. The two HOHs begin contacting their potential pawns to assure them of their safety and explain the week's plan to boot Jace. Nerdy Steve is the most hesistant about the plan because pawns are never really safe. At the nomination ceremony, Jason chooses Johnny and Becky, while James goes second and nominates Steve and Jackie. Becky cries over her nomination, and Jackie is take aback by Steve's weirdness about Battle of the Block. The Battle of the Block competition has the pairs building a new skyscraper while balancing across moving beams. Steve is horrible at balancing, opting to crawl across the beams after multiple failed attempts. Johnny and Becky finish their cardboard box skyscraper first and win the BotB, so they're no longer nominated and Jason is dethroned as HOH. Jason is pummeled with fake cement because what's a dethroning without taking away a little bit of your dignity? With the Battle of the Block over, the next step of the plan is to rally the numbers to have enough to backdoor Jace. James approaches Meg and Clay to add onto the original four of James, Jason, Da'Vonne, and Audrey and an alliance is born. It won't be hard to corral votes when Jace streaks in the backyard and everyone finds it unfunny and an attention-grabbing move. Jace is trying his best to stay safe, offering an alliance to Austin, Audrey, and James called Cloud Town. That is a HORRIBLE alliance name. Speaking of horrible, the Have Not Room is introduced and it's a dentist's office with chairs, etc. It should be John the dentist's personal sanctuary but the out-of-date technology turns him off. While exploring the house to count items, Da'Vonne confuses Clay, Shelli, and Jeff because she went into an empty bedroom that wasn't hers. This triggers a fight between them all, with awkward apologies and hugs. Da'Vonne puts away the "Mama Day" side of her and instead brings out "Day Day" who's ready for a fight. She's more offended by Clay's reaction since she trusted him. He talks to her once in an irritating way and then leaves. Audrey encourages Clay to fake apologize and Da'Vonne sees through all of Audrey's manipulation. James, Steve, Jackie, Becky, John, and Jason (Steve's houseguest's choice pick) are selected for the veto competition. The backyard becomes "Nosa Scotia" where they'll search within rock formation noses to find letters in the gold. Golden nuggets, get it? Like picking boogers. 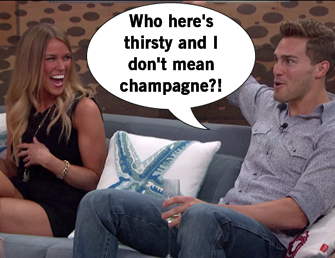 Stay classy, Big Brother. Whoever spells the highest scoring word correctly (ahem, TECHNOTRONICS) wins. Steve slaughters them all but channeling his life passion into a word: "trombonists." But in my heart, John wins because he spelled "boogers" in a nose picking spelling challenge. Never change pale John. Worried about a fractured alliance, Audrey starts reaching out to more potential allies. At 5am. First she grabs Shelli out of bed. Then Jeff. Then Clay. Then Meg. Audrey corrals all the troops to make a secure alliance, and instead this move turns off her allies. Come Veto Ceremony, Steve saves himself from the block. The backdoor plan comes to fruition when Jace is named the replacement nominee. In his Crocodile Dundee hat, Jace is not pleased and puts on sunglasses to cover his tears. Jace himself says this is worse than Y2K, so you know it's huge. James tells Jace that he had to backdoor him because he's a competitor. Quick to try to look great, Audrey tells Jace she was in no way involved and he doesn't believe her. Jace isn't going to go down without a fight, campaigning to everyone in irritating and nearly begging ways. Audrey tries to tell Jace that the entire house knew about the plan to backdoor him, but he turns the tables on her saying she was the one who planted the idea that Jason could be backdoored if Audrey/Jace aligned. Oh hey, remember the Twin Twist? The show finally did on the live eviction episode. The twin in the house is Liz and her twin is Julia and they've swapped four times so far. When the swap happens they have ten minutes in the diary room to swap stories and get information so the game can be played as seamless as possible. At the live eviction voting, they get to vote together live AND swap at the same time - twin twisty drama! Now can't one get into a showmance and force the others into it? After Jackie's corny goodbye speech which includes quotes straight off wooden plaques and Pinterest, Jace asks to be followed on his social networks and outs the eight person alliance that betrayed him. The house joyfully casts their votes to evict Jace, except Audrey for votes for Jackie. Of course this is probably one of Audrey's "brilliant" mastermind moves to create distrust which will probably backfire immediately. The Twin Twist switch is fun to see play out on live TV to no one's notice. 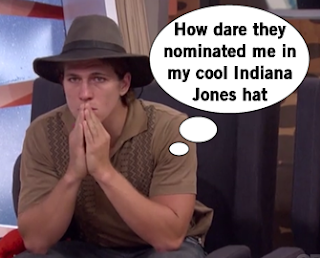 Austin throws on his top hat to be his alter-ego Judas to vote, and it's like two Twin Twists happened. Jace is evicted, hugging his former houseguests, and does a roll on the floor. If you needed more reasons to dislike Jace, he's happy to see Frankie Grande in the audience when a real superfan would shout expletives. Jace is not surprised Audrey didn't vote to evict him but is very surprised about the twins. Good news: since Jace knows all this info, he's clearly not returning to the game. The BB Takeover music apparently sounds but it's a technical glitch, sparing the viewers from that awful sound drop. Comedian and Big Brother superfan Kathy Griffin joins Julie Chen to announce her Takeover twist: the last laugh. A phone will be placed in the house and whoever answers the seventh phone call will receive the power to keep three people from voting at the next eviction. Ok, that's a cool twist. But onto the HOH competition, which consists of two rounds to name 2 HOHs. 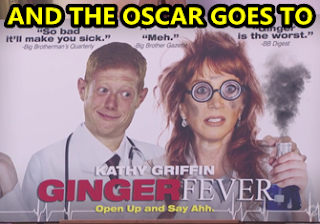 The houseguests will have to assemble a new billboard for a fake movie called "Ginger Fever" starring Kathy Griffin and BB15 winner Andy making the worst derp face. But Andy gets dumped in the new poster for some hot stock photo model, poor guy. The co-HOHs for week 2 are Becky and and Shelli, so this should be very interesting.